His mother has rheumatism. She's also coughing. 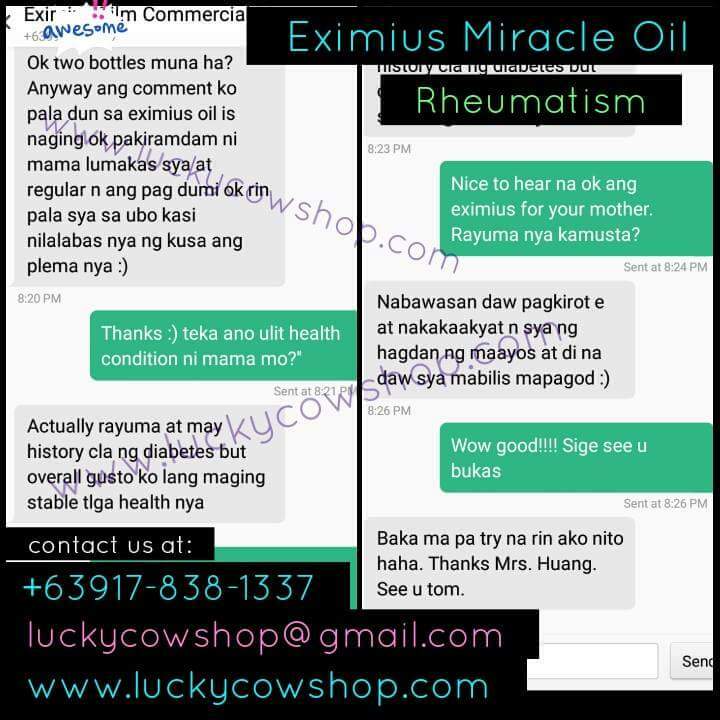 She took Eximius Oil. She is now better. Here's a rough translation to English of our conversation. Me: Thanks :) wait what is your mother's health condition again? Him: Actually rheumatism and they has a history of diabetes, but overall I just want to make her health stable. Me: Nice to hear that Eximius has do good to your Mother. How's the rheumatism? Him: The pain is lessen and she can now go up the stairs properly and she doesn't easily get tired. Me: Wow good!!!! Okay see you tomorrow. Him: I might also try this haha. Thanks Mrs. Huang. See you tom. If you know who has rheumatism (rayuma) or body pain, please share to them this product. This product can help them.